You could write a book on Glasgow Cafes, but making my first blog post about my favourite one seems like a good place to start. Maurizio and Ester took over North Star Cafe 2 or 3 years ago and have developed it into a warm and friendly place, where it’s often nearly impossible to find a seat. The cafe is open from 8 in the morning (except on Sundays when it opens at 10) until about 5.30 in the evening. They serve breakfasts (the french toast is particularly popular) and breakfast rolls, panini, homemade soup, sandwiches, foccacia and lots of homemade baking including gluten free cakes. They also make excellent coffee and make freshly squeezed orange juice. But what really sets this Glasgow cafe apart are the lunchtime specials. 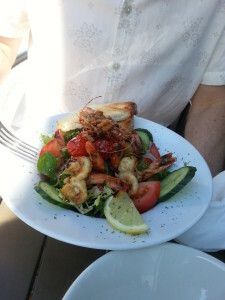 Maurizio is an excellent chef and every day you can choose from one of 2 specials, which he cooks from scratch. (so you do have to wait a bit) Many of these traditional Italian dishes, some have a Scottish flavour and he often cooks what’s fresh that day. If you take a look at their Facebook Page you’ll see lots of pictures of the yummy things he creates. The dish in the picture was amazing and we even got to sit outside. Gorgeous prawns in fresh tomatoes. Ester keeps things running like clockwork and remembers everyone’s name. For many locals, North Star has become a 2nd home.They are very much part of the Queen Margaret Drive Comminity which is a thriving area independent shops and businesses. 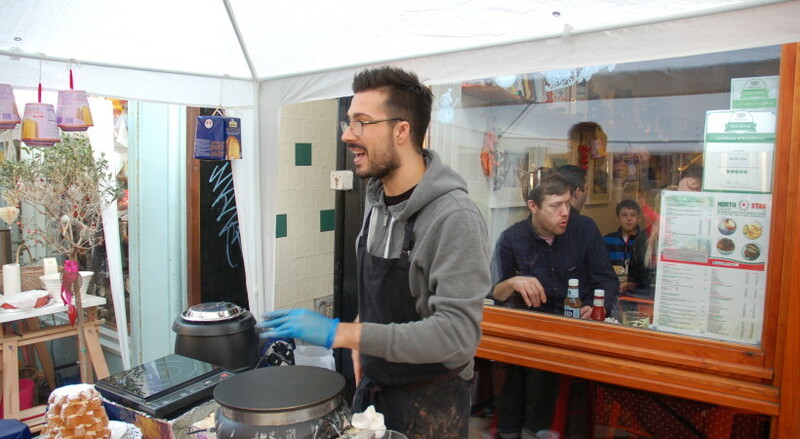 There are 2 street festivals a year and the picture at the top was taken during the Winter Festival where Maurizio was making crepes outside the front of the cafe. If you’re up in Byres Road or visiting the Botanic Gardens, it’s only a 5 minute walk up to Queen Margaret Drive, so you have no excuse not to check it out.